While we transition into the seemingly unbearable wait between issues, the news continues rolling into the hungry fans! Yesterday the solicitations for September’s issue #9 were revealed! It would seem that after the mystery of Mr. Tinker is revealed and Whisper joins the crew, that villain lurking in the shadows will finally make their move and launch an assault on Angel Island in attempts of capturing the Master Emerald. It will be up to Sonic and ALL of his friends to stop them! 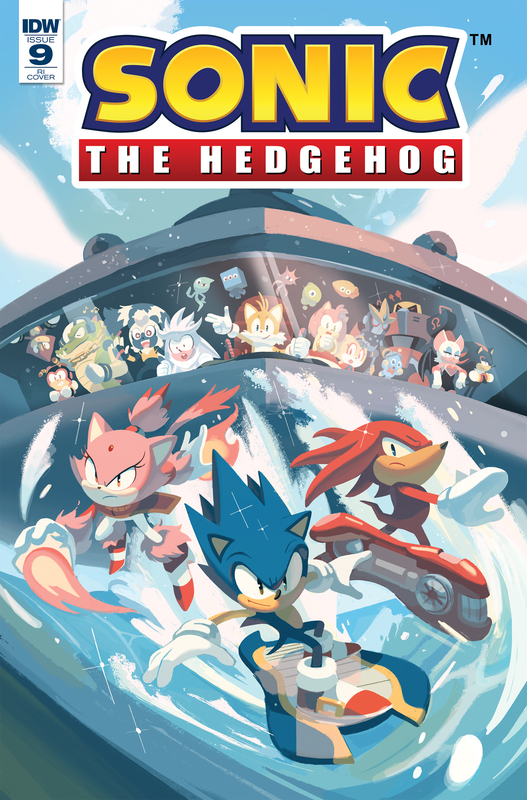 And thanks to hints from Nathalie Fourdraine‘s RI cover, this may very well include many characters we have yet to see in the new series and all of the ones we have already, including: Sonic, Tails, Knuckles, Amy Rose, Vector, Espio, Charmy, Tangle, Silver, Blaze, Cream & Cheese, Whisper, Shadow, Rouge, and Omega, Gemerl, as well as the Wisps! Likewise, the currently revealed cover by Nathalie Fourdraine shows some of our heroes riding on Extreme Gear which may indicate that the Babylon Rogues: Jet, Storm, and Wave may also make an appearance, or perhaps it was just a stylistic choice for the cover, you never know! Issue #9 marks the beginning of the “Battle for Angel Island” arc which I predict will bring us to the end of year 1. It is currently scheduled for release on 9/19/2018 and will be written by Ian Flynn with art by Tracy Yardley. There will be 3 covers: The A cover will be illustrated by Lamar Wells who did cover work for later issues of the Archie run as well as the Super Special Magazines and Digests. The B Cover will be by interior artist, Tracy Yardley, and Nathalie Fourdraine will continue her streak with her 9th Retail Incentive cover in a row! We are only a few months away from the start of the exciting conclusion of the first year of IDW Sonic! Are you ready for the this big event?! Previous Issue #6 and Box Set Delayed! This cover made my day!! A question I have I couldn’t find your issue 5 review on the site. I’m a bit behind! Trying to catch up today! Expect a lot of articles to pop up! I’m a little worried about the wisps on the cover. I’m not a big fan of how prolific they’ve become int he series. They made sense in Sonic Colors, and I’d like to see them stay mostly there.